Many designers say that nowadays finding an interior designed in some single style from A to Z is almost impossible. Most interiors that we see on HomeKlondike are also not an exception. They are eclectic. Though we usually define homes as Scandinavian-style or art-deco-style, for example, as a rule we mean just some dominating concept, while motifs of absolutely different styles can be found in the same room in most cases. The room that we’d like to show you today is also eclectic. And this time contemporary style and Scandinavian background are mixed with …oriental motifs. How? Let’s see! 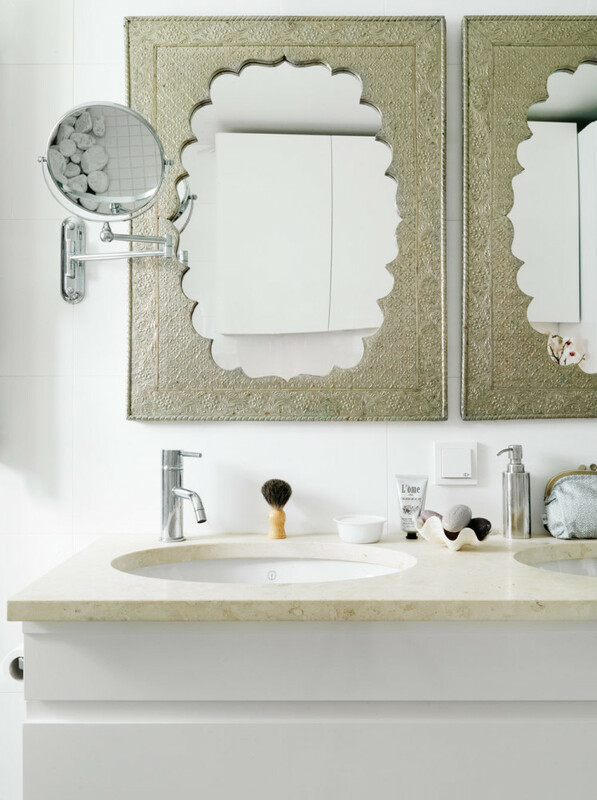 The walls and floor of this bathroom are finished with plain white ceramic tiles. Thereby the flooring is decorated with small matte square-shaped pieces, while the walls feature large-scale glossy tiles that add even more light to the room. The furniture is also light. Besides, the designer used one more unhackneyed trick: white walls are a typical feature of Scandinavian style, but here they became a perfect background for austere items of décor in oriental and even antique styles. Perhaps, the most obvious interior element revealing the hosts’ passion for travelling and East is an Indian lion’s head. It was placed on an antique column, which surprisingly blends well with the contemporary background. 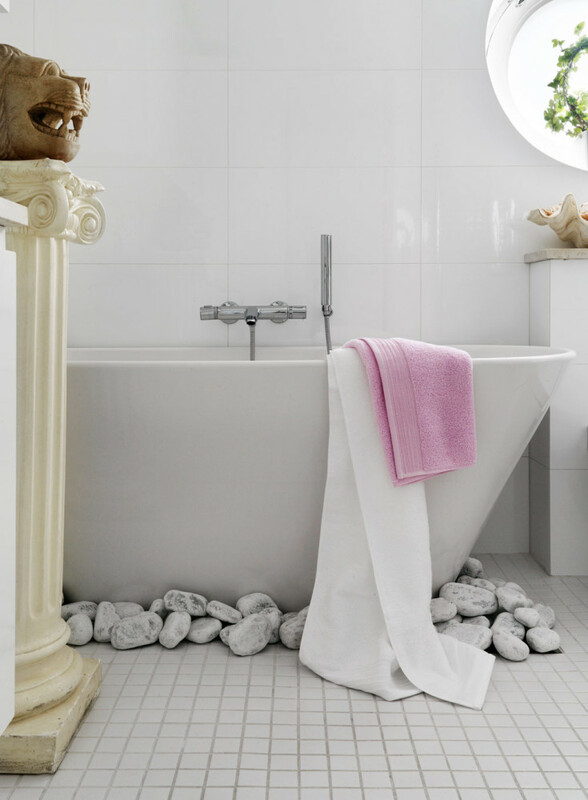 A simple, yet very beautiful thing that deserves a special mention is the piece of décor made from common rocks. Instead of conventionally cutting tiles around the bathtub foundation, it was determined to conceal these problematic areas with plain stones. To crown it all, they conceal a drain for removing extra water. One more oriental detail is a couple of gorgeous mirrors. 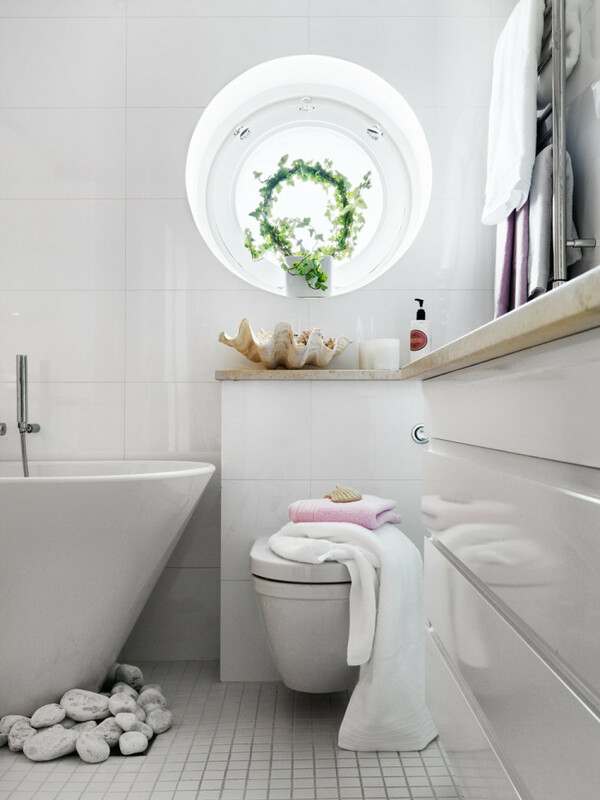 They both add the sense of coziness to the bathroom interior and make it one-of-a-kind. Thus, the decorator’s intentional deviation from stylistic templates allowed for fitting oriental luxury into a laconic white room. If the East is something that makes you tick as well, feel free to complement your bathroom with versatile oriental accessories. These can be candles, soap dispensers, organizers or even indoor plants. A must-have of oriental style is textile. Decorate your window with beautiful drapery and put a rug with oriental motifs on the floor. In such a bathroom you’d finally feel safe and relaxed after a long working day. Just light a candle and that’s it! And in the morning the color palette and light of this interior would cheer you up and set the right mood for a new nice day!